Drinlarr the barbarian continued with what he thought was the simplest path, and went through the central door. Yet again the room was identical to the last. "Blast this infernal maze!" the barbarian bellowed. There were again four doors, one to the left, one straight ahead, one to the right, and the one behind him that he had just entered through. He snorted, and his belly rumbled. The room appeared empty, no pesky imps or goblins to bother him. There were however the remains of what Drinlarr assumed must have been a less fortunate warrior. The skeleton showed the signs of many years of decay, it's armour however was still relatively intact. The breastpiece should signs of a fierce battle, the warrior seemingly skewered by whatever beast had defeated it, but his gauntlets caught the barbarians eye. "Be a shame to leave them lying there..." he thought and began to tug at the skeleton. They seemed stuck fast. - If you choose to take the gauntlets they will gain you 5 skill points. You can 'buy' them for 5 gold, or if you don't have enough (which you don't) you can submit as many gold as you like and leave the rest to the dice. eg If you submit 2 gold, you will need a dice roll of 3 (or more), if you submit no gold you will need a dice roll of 5. If the dice leaves you short, you will take damage as normal. Please also submit how many attempts you would like to have before quitting. Ak, please submit your points in the forum using a short story. You may also include a small 8x8 MOC if you wish. Once you've done this I'll crunch the numbers and write up the result, then move on to the next player. Deadline - Wednesday Edit: Copy and paste error... Deadline - Friday! Drinlarr was a bit baffled when he encountered some initial resistance in his attempt to pick up the gauntlets. "What kind of wizardry is this?" he pondered aloud. "Maybe they're rusted on, or some such thing. Nothing a quick poke with Ragnor won't solve, and then I think I'm going to try this path to the left!" 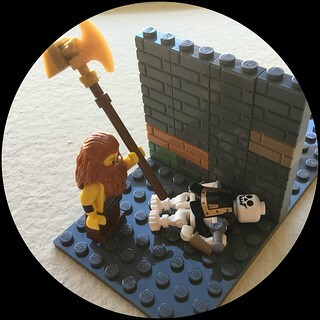 The barbarian's hammer smashed the skeleton to smithereens and the gauntlets clattered to the floor (Drinlarr submits 3 gold. 5 points are needed. He rolls a 3. 3 gold + 3 dice = 6. Points are resolved). Drinlarr observed the gauntlets which glimmered and almost seemed to glow even in the gloom of the dungeon. He clasped the gauntlets around his wrists "A perfect fit! I feel renewed!" he bellowed, pleased with his new bounty (Drinlarr adds 5 skill points to his score) and turned to exit the chamber by the door to his left. Drinlarr adds 5 skill points to his score. Meanwhile, in another part of the labryinth the ninja Sling Mau snuck through the shadows almost undetected. He entered a room identical to the last, with a wall to his left, a door straight ahead, a door to his right, and the door behind him through which he had just entered quietly. Unfortunately for him he entered a room where sight was not needed to be detected. For also hiding in the shadows was a a beast, a monster that saught to cause him harm. The vilderbeast could sense many things without sight, whether by magic or others means, this beast already knew that one of it's kind had been slain (*see drakk's round 1 encounter ToMB fans ). Although solitary beasts, with little care for other creatures this thought still enraged the monster. So out of the shadows, its fangs dripping, its claws scraping on the cold stone floor, its tail lashing from side to side the Vilderbeast emerged. Josdu, please submit your points in the forum using a short story. You may also include a small 8x8 MOC of the vilderbeest if you wish, you can use Drakks as reference or create your own, magical monsters take many different forms... Once you've done this I'll crunch the numbers and write up the result, then move on to the next player. Deadline - Tuesday if possible. After the fight Mau will go straight. The ninja launched a furious attack and struck first with his magic (magic 5 + dice 5 = 10) but the Vilderbeast sensed the magic and responded with it's own attack (magic 4 + dice 5 = 9. Monster takes 1 damage). Mau struck again, slicing his blade at the terrible creature (strength 5 + dice 5 = 10), the vilderbeast screamed slashing it's claws at the nimble ninja (strength 4 + dice 5 = 9. Monster takes 1 damage). With another leap the wily warrior leaped through the air grazing the vile vilderbeast with his sword (ninja skill 3 + 5 = 8. Vilderbeast skill 2 + dice 5 = 7. Monster takes one damage!... and yes I did just roll six 5s in a row ToMB fans). The monster shrieked and a magical pulse sent a shockwave through the chamber knocking the ninja off his feet (Vilderbeast magic 4 + dice 6 = 10. Mau magic 5 + dice 3 = 8. Mau loses 2 health). The ninja struck back, but his attack was parried by the beast (Mau strength 5 + dice 4 = 9. Vilderbeast strength 4 + dice 5 = 9). Mau re-adjusted his footing and deftly sprang off the nearest wall, slicing the vilderbeast as he glided through the air (Mau skill 3 + dice 4 = 7. Viderbeast skill 2 + dice 1 = 3. Monster takes 4 damage...). The vilderbeast shrieked and shrivelled, leaving a pile of dust at the ninjas feet, which then scattered as a gentle breeze blew across the stone floor. The wind seemed to come from the right, but as it swirled around the small chamber, the ninja became uneasy. He sheathed his sword and keeping the wall to his left, continued his quest by taking the door straight ahead. Mau defeats the vilderbeast but loses 2 health in the process. He gains 1 luck for a successful conflict and 3 gold for submitting a MOC within the deadline. Rulf the Orange continued straight ahead. Keeping a wall to his right felt like the safest thing to do at this time, and meant he could easily retrace his steps if he met a dead end. The next room was identical to the last, with a door straight ahead, one to his left, a wall to his right, and the door behind him that he had just entered through. Blocking his path however, in the centre of the room, and gnawing on a bone was a troll. And Rulf didn't fancy being the next course of the troll's meal. Fritzix, please submit your points in the forum using a short story. You may also include a small 8x8 MOC if you wish. Once you've done this I'll crunch the numbers and write up the result, then move on to the next player. Thurs/Friday if possible. Sorry for the late post, I completely missed it. Rulf didn't use his skill so that is returned to him (no magic was submitted). He receives 1 luck for a successful (and brief!) conflict and 2 gold for his 8x8 moc. The warrior Malekk continued cautiously through the labyrinth. As a magic user he could sense that there were unnatural forces at work that sought to confuse and invade a warrior's mind. He could almost hear the walls whispering to him tales of times past, of fallen heroes. "Lies, all lies!" he convinced himself. The labryinth sought to fill a warrior's mind with fear and despair. He took the door straight ahead and entered another chamber similar to the last. There were 3 doors. One behind him, through which he had just entered, one to his right, and one straight ahead. There again was a wall to his left as if he was skirting the edges of the labryinth perhaps. He was shaken from his thoughts by a creature in the corner of the room. Drakk, please submit your points in the forum using a short story. 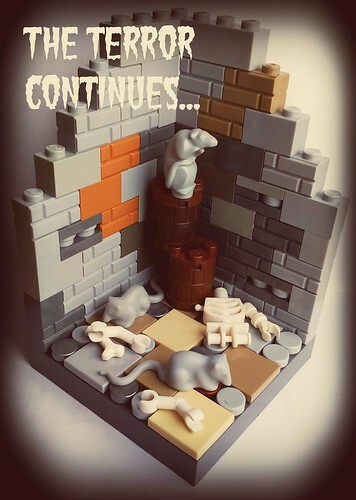 You may also include a small 8x8 MOC if you wish. Once you've done this I'll crunch the numbers and write up the result, then move on to the next player. Deadline - Wednesday if possible. But the goblin lashed out first grazing Malekk as he defended himself (goblin strength 2 + dice 6 = 8. Malekk strength 3 + dice 4 = 7. Malekk takes 1 damage). Malekk's alien companion struck out in a furious response, injuring the goblin with it's venom (Malekk magic 3 + dice 5 = 8. Goblin magic 1 + dice 3 = 4. Goblin takes 4 damage). 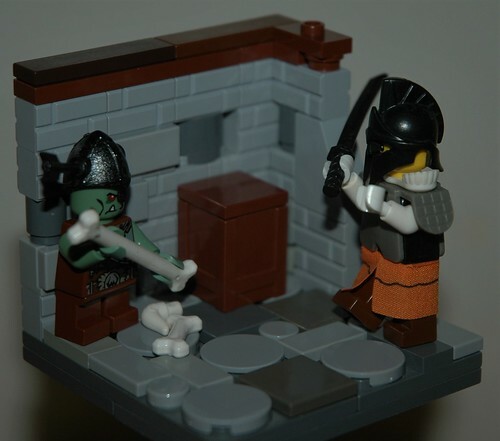 The warrior lay on the floor as the goblin snarled and licked his lips, raising his sword for on final assault. It looked like Warlock was on the menu... But enough was enough... Kill, Kill, Kill. Malekk's serpentine companion invaded his mind. Get up! Get up! And kill! The goblin struck (goblin magic 1 + dice 5 = 6) but so did the warlock's 'helper' (Malekk magic 3 + dice 3 = 6. No damage on either side) blocking the goblin's attack. Malekk rolled to his feet, gripping his sword as he turned, and swung his blade at the infuriating opponent (Malekk skill 4 + dice 5 = 9). The goblin was surprised by the warriors seemingly quick recovery and forgot to duck (Goblin skill 4 + dice 1 = 5. Goblin takes 4 damage...). Malekk's strike took the goblin's head clean off his shoulders, and it fell to the floor with a clatter, the decapitated body then crumpling to the floor (Goblin dead...). The warlock's alien companion hissed and spat, then retreated to Malekk's back. It had been a hard and unexpected battle. He had taken heavy damage and would need time to recover before heading through the door to his right. Malekk defeats the goblin but loses a heavy 16 health in the process! He gains 1 luck for a successful conflict and 3 gold for submitting a MOC within the deadline. Astrid, the valkyrie, had defeated her first opponent will minimal effort, but her second would not be so easy. She left the room with the dead imp and took the door to her right. Exiting through the door into another almost identical chamber. There were four doors this time, one straight ahead, one to her left, another to her right, and the one behind her that she had just moments ago passed through. She adjusted her grip on her spear, something was not right. She felt uneasy, and an unsettling breeze blew through the chamber. Blocking her path, in the centre of the room, was what looked like a pile of rubble. Stones that had perhaps fallen in from the ceiling. She looked up, but the chamber's ceiling seemed intact. Strange, she thought. A slow rumble began to reverberate around the room. An earthquake? The pile of rocks, shuddered and moved, taking a new shape and form until they rose to become a large humanoid shape. It was a stone golem. Fenrir, please submit your points in the forum using a short story. You may also include a small 8x8 MOC if you wish. Once you've done this I'll crunch the numbers and write up the result, then move on to the next player. Deadline - Friday! Astrid was running from corner to corner trying to out manoeuvre the golem but whit every passing moment she was getting tiered. She knew this was going to be a problem but taking a look at the golem and seeing that it was confused by her quick movement she attacked. She struck the stone monster hard (strength 8 + dice 1 = 9) and the golem staggered back (strength 5 + dice 1 = 6. Golem loses 3 health). The creature swung an arm at the warrior causing rubble and debris to fall from the ceiling, Astrid sensed his attack and quickly darted out of the way (Golem magic 4 + dice 2 = 6. Astrid magic 6 + 2 = 8. Golem loses 2 health). The golem crashed into the far wall as the weight of his missed swing took him off balance. Astrid saw her opportunity and, propelling herself off the wall, she spun through the air and slammed her spear into a crevice in the golems neck (Golem skill 4 + dice 1 = 5. Astrid skill 4 + dice 6 = 10. Golem loses 5 health. 3 remaining). The golem rumbled, as a magical construct of rock and stone he lacked the ability to scream. He scrapped around trying to release the warrior, and her spear, that was planted in his back (Golem skill 4 + 1 = 5). But Astrid held on fast, as the monster crashed around the chamber. Finally, with all her might, she put her full weight onto the spear and swung away, and in doing so, causing the crevice to expand, and the golem to come crumbling down (Astrid strength 8 + dice 5 = 13. Golem takes 7 damage... dead). The valkyrie stood in the centre of the chamber surrounded by the rocks that had previously made up the golem. It had been tough, but she had fought harder foes and always came out victorious. So far. She surveyed the room and remember that she still had a choice to make. Would she take the door to her left, the door to her right, or continue straight on? 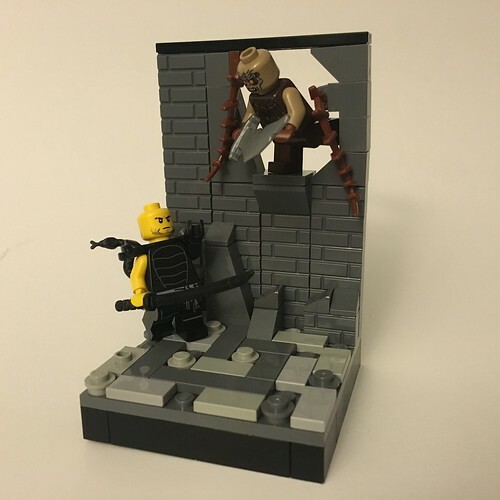 Astrid defeats the stone golem. She gains 1 luck for a successful conflict but no gold as no MOC was submitted. She also still needs to choose which door to use for the next round (please PM me with your choice).